Born in Kanagawa- Japan, 1975. He does directing and the editing of the picture such as a promotion video, a commercial, and mainly on a movie in freelance. 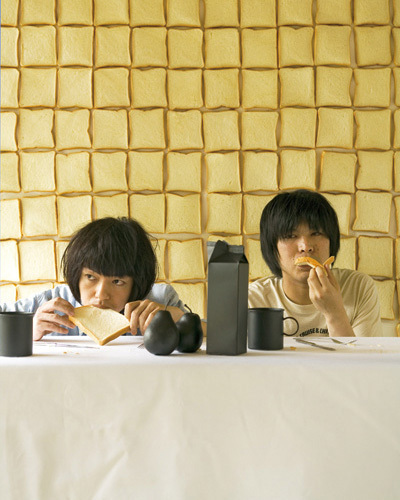 His short film “Tomato Juice” won a Cave Films’ special prize in Mito Short Film Festival 2004. In 2008, his first future film "a Building & a Zoo" was shown nationwide. In this movie, he was elected one of the promising young director by VIPO (visual industry promotion organization) organized in movie maker and TV station and “a Building…” was shown in Korean movie festival. 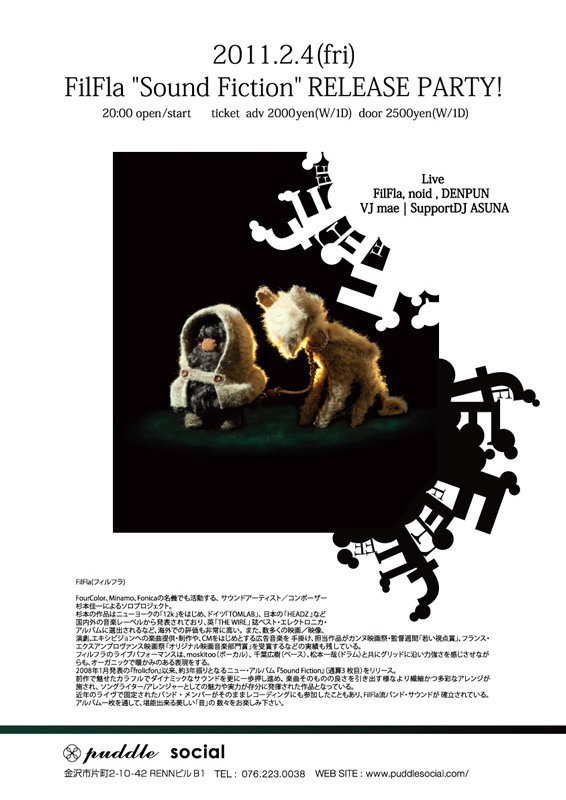 Yamaha x au Design project 2008, 2016 Tokyo Olympics invitation pictures (FILM4). 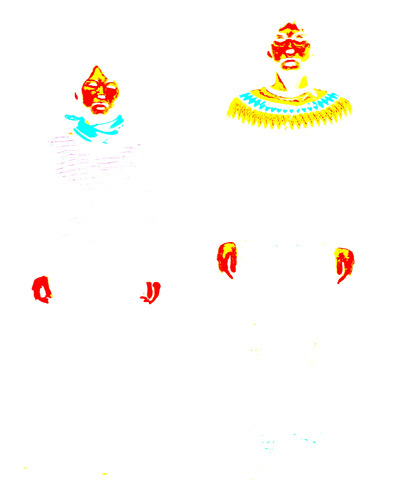 I express undulate steady rhythm like heartbeats with hands and feet, and indicate colorful pop sounds with props and stage. I want you to enjoy the limited world change with a fixed point camera from overlook. It is “Night” that I imaged from this music. The alley where the light burns. The town filled with crowds. The shining starlit sky. The sea of the high tide. "All" of night time from sunset to the sunrise. We have "Door ticket". Please get the ticket at the O-nest. *You can get fee the postcards sets. If you reserved the event. Limited 100 persons. 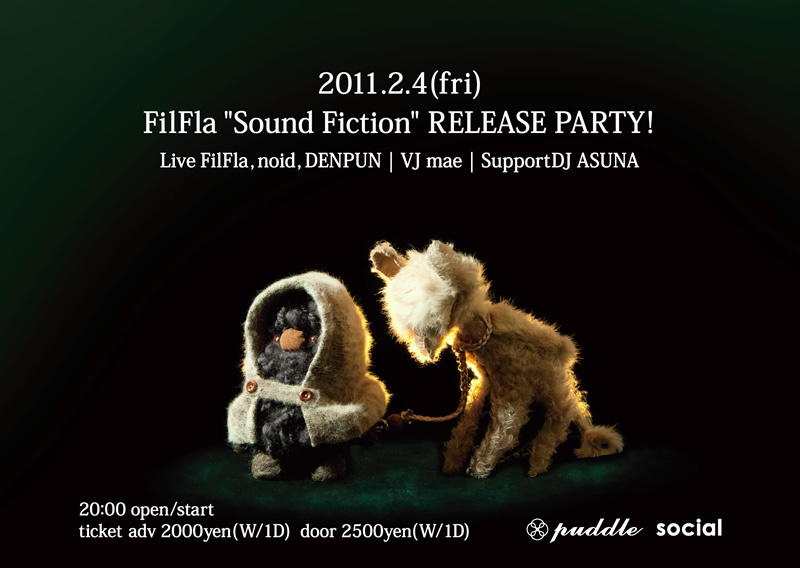 FilFla "Sound Fiction" RELEASE PARTY! 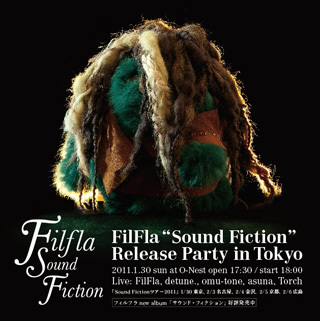 FilFla"Sound Fiction Release Tour in Kyoto"
The ticket which Sound Fiction release party is available now. The Music Video "All" out now! 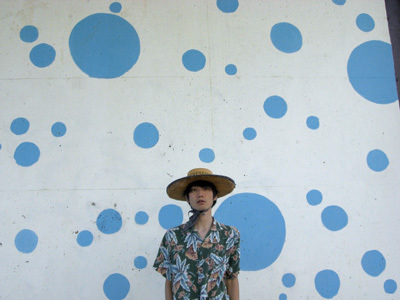 Keiichi Sugimoto is an international artist and composer from Japan. 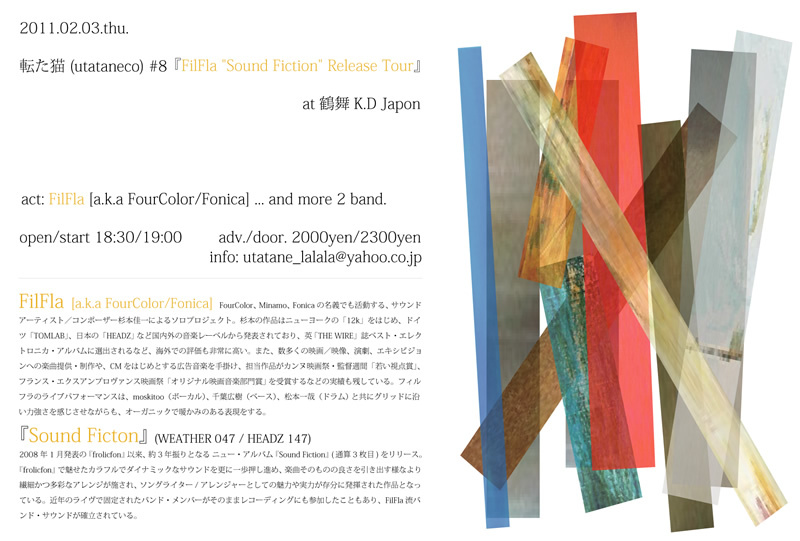 He plays in several sound projects such as FilFla, FourColor, Minamo and Fonica. 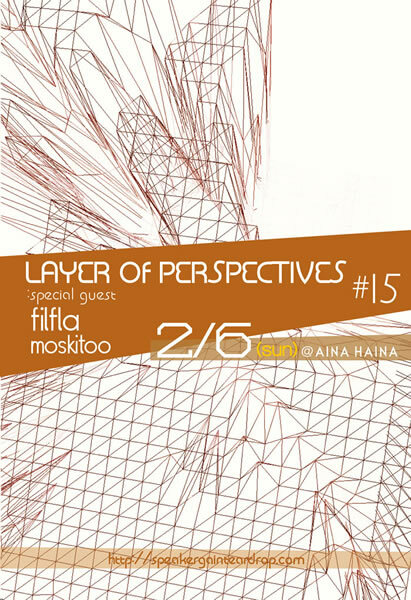 His compositions have been released from record labels throughout the world such as 12K (US), apestaartje (US), TOM LAB (Germany), and HEADZ (Japan). As FourColor, his album "Water Mirror" was chosen among the best electronica albums in the THE WIRE magazine (UK). He has also toured extensively in Europe, Asia, Australia, the United States, and Canada. He has provided numerous tracks to films, visuals, plays, exhibitions, television, web commercials, and company videos. 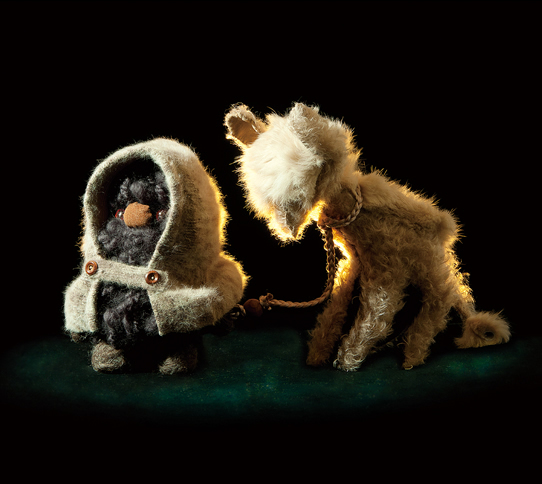 In 2004, FourColor provided the music for director Jun Miyazaki's "FRONTIER", appearing at the Cannes film festival. In addition, the film won the "Young Viewpoint" award during the director's week. 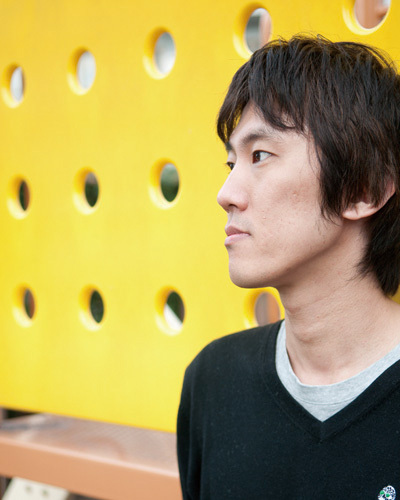 In 2006 at the France Aix-en-Provence film festival, Keiichi Sugimoto won the original soundtrack prize, for his soundtrack of "Whirr", a film by German director Timo Katz. 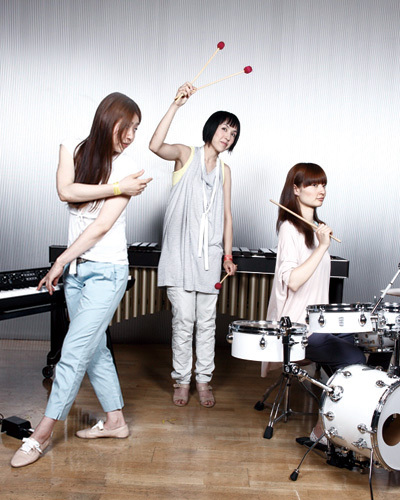 By 2007, these achievements had lead Sugimoto to be registered to the French film composers association (U.C.M.F). In addition to his artist activities, in 1999 he established Cubic Music, a record label to release music and to organize events. 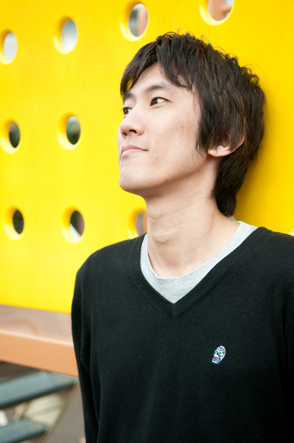 Some of the artists he has released include World's End Girlfriend, Kyo Ichinose, piana, and No.9. He has also been active in inviting foreign labels and artists to perform in Japan, as well as organizing tours for international labels such as 12K, Hapna and TOM LAB. 2010 @ Keiichi Sugimoto All Rights Reserved.